She told us many times over the years, that she wanted a Canadian flag draped on her coffin. She was proud to have served her country, and so, when our Mother died in 2007, we contacted the Legion in Perth, and they were quick to deliver a flag to the visitation room and place it solemnly over her casket at Blair and Son Funeral Home. When a dozen Legion members arrived at the funeral home before the visitation began, they handed each of us a poppy and requested that we lay them on top of the flag at the close of their ceremony. They marched into the room to the melancholy strains of the bagpipes, fittingly, as our Mother’s ancestors hailed from Roxburghshire, Scotland. The Legion members, all in uniform, proudly wearing their medals, filed by, and paused to greet each one of our family. These were not young soldiers, but many were in the later stages of their lives, and most were veterans of WWII, like our Mother. They were the survivors, who had witnessed many fallen comrades, but through the grace of God had been spared, and had lived, some burdened with dark memories of the war. Often, at this time of year I recall Mother’s quiet patriotism. She was, after all, a first generation Canadian. Her father, an American, born along the shores of the St. Lawrence River in New York State, and her mother hailed from Huddersfield, England, but Mother, born at the Royal Alexandra Hospital in Edmonton, Alberta, was all Canadian. She never missed an opportunity to vote in an election, and would remind us that battles were fought and lives were lost so that we could have this privilege. She embraced freedom of speech and the freedom to choose one’s religion. This blog in memory of Cpl. Audry Rutherford (Stafford) R.C.A.F. W.D. 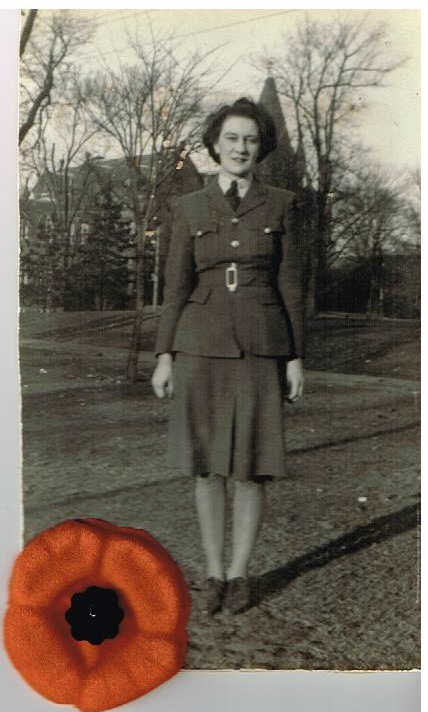 This entry was posted in Historical Interest and tagged Arlene Stafford-Wilson, Audry Rutherford, Audry Stafford, Canadian Legion Perth Branch, Lethbridge Alberta soldiers, Perth Legion, Perth Ontario, RCAF Women's Division, Rememberance Day, Soldiers from Edmonton Alberta.